Just to mix things up, this is a new addition to our ‘Out of Cardiff’ section. There are so many beautiful places to visit within driving distance of Cardiff, and Mwnt is definitely one of them. When I mentioned to friends that we were heading to West Wales, so many people told us to go to Mwnt that I knew we had to head there. It’s a stunning location. It wasn’t a great day in terms of weather when we visited, but the dark skies and whipping wind only added to the drama and romance of the place. 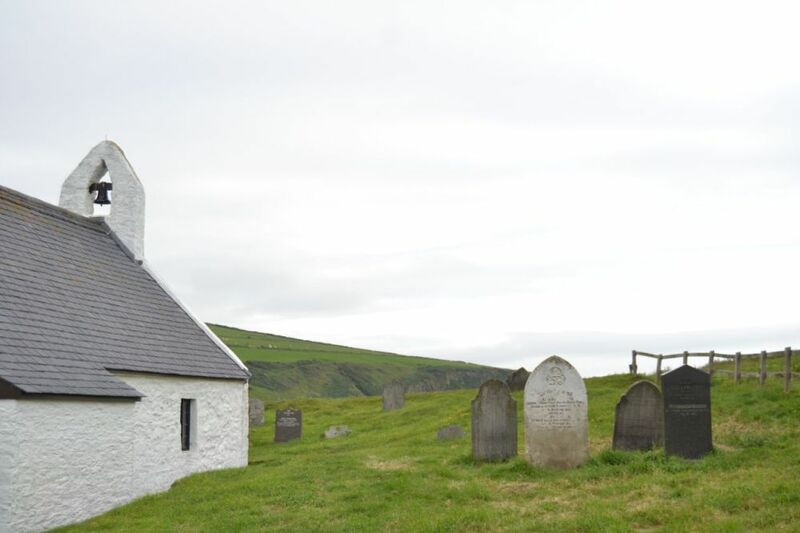 Mwnt is also an ancient holy site. You can sit and contemplate higher meanings in the beautiful and tiny Church of the Holy Cross (Eglwys y Grog). It was probably built around the 14th century, and served as a medieval sailors’ chapel of ease (where you could pop in and worship when you were away from home). Wikipedia says it was a welcome refuge for medieval pilgrims en route to the patron saint of Wales’ shrine at St Davids, mystical Strata Florida Abbey or Bardsey Island in North Wales (all places on my list to visit!). It was pretty cold while we were there, but we had a nice walk up the Wales Coast Path here. There are fields of horses lining the cliffs, while you look out on a seemingly endless sea. We also made friends with this cheeky little dog in the car park, who smelt us cooking sausages! I love Mwnt too. In May 2015 I wrote a tale about the giants of Mwnt and the making of the coast path. It’s at https://sarahtanburn.wordpress.com/2015/05/24/giants-lived-in-mwnt-how-the-coastal-path-was-made/ if you want to enjoy another take.